Who are the Arabs of Chicagoland? Ray Hanania is an award-winning columnist, author & former Chicago City Hall reporter (1977-1992). A veteran who served during the Vietnam War he is the recipient of four SPJ Peter Lisagor Awards for column writing, (1985, 2002, 2006, 2009) and the National Sigma Delta Chi Award. Hanania was named “Best Ethnic American Columnist” by the New America Media in November 2006. Hanania writes weekly opinion columns on mainstream American & Chicagoland topics for the Southwest News-Herald, Des Plaines Valley News, the Regional News, The Reporter Newspapers, and Suburban Chicagoland. Hanania also writes about Middle East issues for the Arab News, and The Arab Daily News analyzing government policies in the Israeli-Palestinian conflict & Arab World. A critic of mainstream news media bias, Hanania advocates for peace & justice for Israel & Palestine, & the empowerment of Arabs in America. Hanania launched a standup comedy career immediately after Sept 11, 2001 bringing together Palestinians and Israelis to promote peace and coexistence. He was immediately attacked by Palestinian fanatics, Arab comedians and Israeli extremists who all reject “normalization” and the performance of Palestinians and Israelis together on the same stage. Many Arab comedians only perform with Jews, and many Jewish commedians boycott Palestinians. In August 2002, Hanania was removed from a show at Zanies Comedy Club in Chicago by Jewish Comedian Jackie Mason. Click here to read about the incident. Click here to email Hanania. Click Here to LISTEN to Hanania’s live radio show on 2nd Friday every month 7 AM CST. Click here to listen to Ray’s Podcasts. 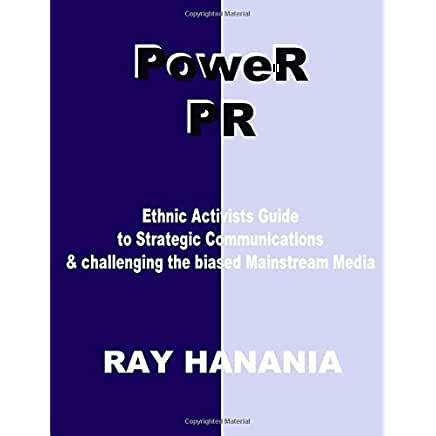 PoweR PR is a simple to follow blueprint for Ethnic and Minority Activists to help them develop strategic communications plans to overcome the bias in the mainstream news media to advance their narrative. The mainstream news media is biased, especially against "minority minorities." This book helps you write the message and create the products to help promote the message directly to the target audience. It details the 10 Fundamentals of Strategic Communications. I'm Glad I Look Like A ... Terrorist is a humorous and realistic look at the American ethnic experience by an award-winning Palestinian-American journalist. Hanania describes the subtle and not-so-subtle bigotry facing Arab Americans and offers some solutions for improving America's perceptions of Arabs.